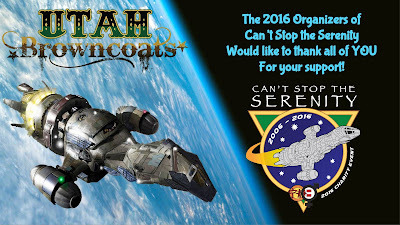 Utah Browncoats Society: CSTS Salt Lake City! Thank you once again to our very generous Browncoats who donated to our Can't Stop the Serenity 2016 events! We could not do this without your tireless efforts and support. Because of you, we are able to announce our total donation of $4,424, which exceeds our 2015 amount! 75% is being sent to Equality Now, to continue the work of advocacy for women and girls worldwide. 25% goes to the wonderful charity, Kids Need To Read, who provide books for underfunded libraries throughout the US. Who knew you could have so much fun while helping others? We just wanted to take a moment and tag some folks who helped make this possible for yet another year. Much gratitude goes to Brewvies Cinema Pub and Legends for hosting our event. Huge thanks to Frankie and Johnnie's Tavern aka The Penalty Box for hosting the Cosplay night, which generated even more donations.Our greatest appreciation to William Pace for the very cool event tickets and graphics. Thank you to Lora Harpster - one of the founders of the Utah Winter Faire , for tirelessly making the beautiful glittery Serenity soaps which graced the goodie bags. Kudos to the folks at the Watchtower Cafe for the coffee boost in every bag as well! Thank you to the amazing people at Salt Lake Comic Con for donating passes to our raffle! Thank you again to everyone for the smashing success, and we look forward to next year!